The Kabooti Ice is the first donut seat cushion with a removable ice pack for cooling relief wherever you sit! We know seating discomfort isn’t the most talked about topic of discussion or something you even want to ask someone about. The Kabooti Ice donut cushion for hemorrhoids (and other medical conditions such as post-partum pregnancy discomfort, perennial wounds, post-surgical pain) is made to provide you all day relief without anyone ever knowing! THERAPUETIC DONUT SEAT CUSHION NOW PROVIDES COOLING RELIEF! The Kabooti Donut Seat Cushion has revolutionized medical seating donut cushions for various medical conditions to provide relief while sitting including lower back pain relief, leg pain relief, hemorrhoids or piles, soothe sciatica nerve pain while sitting, tailbone and coccyx pain relief plus much more! The Kabooti is an ergonomic foam ring donut cushion that features an exclusive orthopedic design to help improve your posture while you sit, spinal alignment and help provide relief for many seating discomforts. The 3 in 1 design makes the Kabooti the only seat cushion you will ever need as it combines the best features of a ring shaped donut cushion, coccyx seat cushion and traditional seating wedge all in one! Our donut seat has completely re-invented ergonomic design you won’t find anywhere else. So if you are looking for a donut cushion for hemorrhoid relief, a coccyx cushion for tailbone relief, or a superior seating cushion that provides improved support and comfort all day long, the Kabooti is the perfect choice! The Kabooti Donut Seat is also available without a gel pack and or check out the Kabooti Wide for a larger booty! 3-in-1 Cushion - Combines the benefits of a donut cushion, coccyx cutout and ergonomic wedge design to provide all day comfort and support with one cushion. Reduces Tailbone Pressure – Extended Coccyx Cutout reduces tailbone pressure while sitting to provide comfort and relief for your coccyx region. Provides complete comfort for sore areas and promotes air flow so the users is cool and comfortable. Tapered Wedge Cushion Design – Reduces pressure points underneath the thighs improving circulation & distributes your weight evenly. Easily accommodating to use with tables or desks and driving. Ergonomic Sculpted Surface – Promotes proper seating posture by slightly tilting the pelvis forward in order to maintain the spine’s natural lumbar curve. Perfect for those who are looking to reduce lower back pain and increase pelvic support while sitting! Improved Seating Stability – Not typically featured in a standard foam ring cushion, the innovative stability lobes improve balance and helps to evenly distribute your weight proving less pressure on your bottom. It’s a fact that 3 out of every 4 people will experience hemorrhoids in their life or some other type of seating discomfort. Foam Ring cushions has been the go to answer for seating relief as recommended by doctors. However, with traditional foam ring cushions, sitting has been a persistent problem as the tailbone still would face pressure from the foam ring, instability, embarrassment from the donut design and discomfort for males because of the traditional design. However, the Kabooti Donut Seat takes great pride in addressing all those seating pains in order to give you a more comfortable seat cushion on the market today! 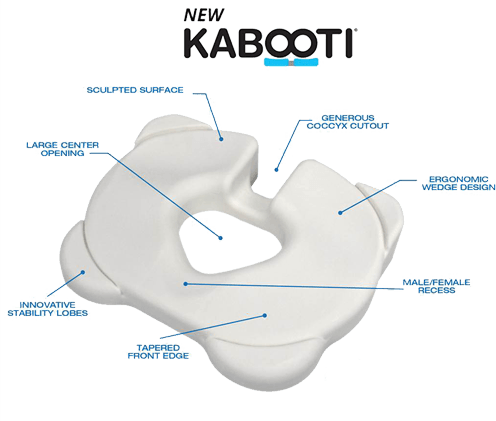 Recommended for its back pain improvements, for women who are post-partum, those suffering hemorrhoids and other bottom pain issues, the Kabooti is the leader in ergonomic donut seat design. Don’t believe us? Try it out, don’t like it? Send it back no questions asked! I have tailbone and pelvic issues; was hoping this cushion would be the answer. It is not for me, as I found the product too hard and the back areas, seem to poke into my body. I was originally, going to return; however, I have decided to try to modify the base, by shaving off the areas the poke me and add some memory foam, to try to soften the seating area. I do want to point out, that I have neuropathy, which makes my skin very sensitive and with added weight loss, the poking of the product, may not be an issue for others. I have not given up hope, with some modification, for my personal issues, this still could work for my conditions. I am particlarly interested in the ability to have the ice pack in the center of the cushion, because I have flare ups in my pelvic area with nerve pain and swelling of the vaginal area. The ability to have an ice pack within a cushion, will be ideal, for these flare ups, as I can use it without embarrassment or drawing attention to myself. Worth the money for amazing comfort! We have several staff members that sit quite a bit and some have health issues causing them to be in pain while sitting. This amazing product the Kabooti Ice cushion and getting an additional ice insert is definitely worth the money! Absolutely love this contour donut cushion! It relieves my back pain. I've tried others but this one fits perfectly, and allows your curves to relax in to it, rather than sitting flat. The cover material allows you to scoot forward or back when sitting down or getting up without the cushion moving also. The ice insert helps relieve pain. The ordering process was easy and it arrived very fast, just with normal shipping.